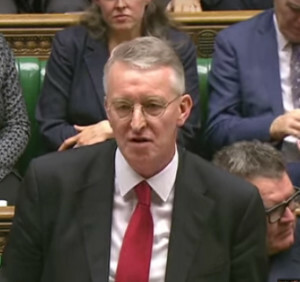 Hilary Benn’s Commons speech in the Syria debate on 2 December has received high praise from right wing politicians and the media. It has been variously described as “one of the great speeches of the House of Commons” (Phillip Hammond), a “tour de force” (Tony Blair), “electrifying” (Andrew Rawnsley in the Observer) and “politically elevating” and “riveting” (Martin Kettle in the Guardian). On close examination, however, it turns out to be a thin affair full of misleading and false claims and with no serious attention paid to contrary arguments. Hilary Benn poses what he sees as a simple question. The question which confronts us in a very, very complex conflict is at its heart very simple. What should we do with others to confront this threat to our citizens, our nation, other nations and the people who suffer under the yoke, the cruel yoke, of Daesh? Notice that the question here is “what should we do?”. This would suggest an evaluation of different courses of action taken separately and/or in combination. In fact, there was no examination of counter-views and no crucial information given such as might change anyone’s mind if they did not already agree. … I believe that we have a moral and a practical duty to extend the action we are already taking in Iraq to Syria. Here, on the basis of absolutely no reasoning the conclusion is stated in advance: we should extend what what we are doing in Iraq (i.e. bombing) to Syria. … the conditions set out in the emergency resolution passed at the Labour party conference in September have been met. Hilary Benn didn’t try to justify this sweeping claim. He didn’t even mention what those conditions were. It is doubtful if the majority of Labour MPs would have had instant recall of those conditions (even assuming that they had ever noted them). It is certain that this reference meant little to other MPs. The conditions set by Annual Conference were: (1) authorisation from the United Nations; (2) a comprehensive plan for humanitarian assistance for any refugees who may be displaced by the action; (3) assurances that the bombing is directed exclusively at military targets associated with Islamic State (Isis); (4) that any military action is subordinated to international diplomatic efforts to end the war in Syria. The first first condition is discussed below. The second is notoriously unfulfilled. The third is meaningless in the conditions in which ISIL operates. The fourth is meaningless without clear specification of those diplomatic efforts and an explanation of what subordination to them means. … in compliance with international law, in particular with the United Nations Charter …. International law allows the use of force in three circumstances: invitation, UN Security Council authorisation, and self-defence. Humanitarian intervention, as was used by the Government to justify intervention in Kosovo in 1999, is emerging as a fourth justification but is not yet fully established. When you want to involve self-defence in the sense that you, as one state, are defending yourself against the actions of another state, or perhaps the actions of a non-state actor based in another state, you have to demonstrate quite specifically that there exists an instant, overwhelming necessity, leaving no choice of means and no moment of deliberation—in other words, an imminent armed attack is going to happen against you unless you act now. … the United Nations is asking us to do something. It is asking us to do something now. It is asking us to act in Syria as well as in Iraq. On the other hand, while the resolution makes no comment on any specific military actions, it does mention some very specific non-military ones such as choking off the financial and other supplies and the movement of people to help the terrorist group. By comparison with bombing, this has proved to be of less interest to Hilary Benn who has talked and written of this only in the most general terms. He could start by speaking about direct and indirect support given to ISIS by two of Britain’s allies, Saudi Arabia and Turkey, and he could mention the Gulf States too when he gets around to proposing action regarding such support. So given that the United Nations has passed this resolution, given that such action would be lawful under Article 51 of the UN Charter – because every state has the right to defend itself – why would we not uphold the settled will of the United Nations, particularly when there is such support from within the region including from Iraq. It is not “given that such action would be lawful under Article 51 of the UN Charter“, as the legal experts called by the Commons Select Committee pointed out. Moreover, while Resolution 2249 says “By whatever means necessary” it does not specifically authorise any specific forms of force and does not invoke Chapter VII of the UN charter which is used for such authorisations. We are part of a coalition of over 60 countries, standing together shoulder-to-shoulder to oppose their ideology and their brutality. 6. Claim 4: the Vienna talks are our best hope. This is probably the safest claim or assertion in the whole speech. Although it has to be said that there is a striking blindness in the claim that an agreement in Vienna would “enable millions of Syrians … to go home”. This image of Kobane, which reports say has been raised to the ground, does not look as though it offers much of a home go back to. Can we really leave to others the responsibility for defending our national security when it is our responsibility? This makes bombing Syria into a direct means of defending our national security. The claim is made without a shred of argument. It also suggests that if we do not do it we would then be leaving defence of our national security to others. Without going to the other extreme of opposing bombing because those targeted might take revenge, it is obvious that the ability of small groups of terrorists to commit acts like the Paris massacre is in no way limited by military action in the Middle East. Moreover groups like ISIL and Al Qaeda, as Mary Kaldor pointed out in Open Democracy, thrive on the chaos of war and provoking their enemies into retaliatory action. It has been argued in the debate that air strikes achieve nothing. Not so. Look at how Daesh’s forward march has been halted in Iraq. The House will remember that, 14 months ago, people were saying: ‘they are almost at the gates of Baghdad’. And that is why we voted to respond to the Iraqi government’s request for help to defeat them. Look at how their military capacity and their freedom of movement has been put under pressure. Just what Hilary Benn was asking MPs to “look at”? How has ISIL’s forward march been halted exactly? It is still able to move freely close to Bagdad. It has lost some areas but gained others. Overall the map of ISIL-controlled territory and territory in which it is free to move does not show much change despite the intensive US-led bombing campaign. It is difficult to interpret these gains and losses but overall it is possible to argue that ISIL has expanded and consolidated its hold over key territories. On the question of the need for coordination with military forces on the ground, Benn admitted that there was scant justification for Cameron’s talk of 70,000 soldiers on the ground with whom air strikes would be coordinated. But he went on to argue that whatever the number, air strikes would, in any event, make things hard for ISIL and would therefore be a good thing. He backed this by quoting a Kurdish official who said that air strikes had been important in the freeing Kurdish areas of ISIL control. But that is precisely because in that case there were unified ground forces with whom the bombing could be coordinated. The high praise for Hilary Benn’s speech has little to do with its content and much to do with it saying what those praising it wanted to hear. P.S. It was said that Hilary Benn’s “tour de force” was being written down in the heat of the debate. In fact the same argument and often the same words was published on his website on 1 December. It is also worth noting that even after the Paris massacre he was still saying that bombing was not a good idea. Posted in: International, Labour, Middle East/North Africa, Politics, War/Defence, Westminster. I don’t disagree with your argument that the left in general has yet to think its way clearly through the stance according to which the enemy of my enemy is my friend. However, I think that the idea that this explains the positive reception of Benn’s speech is far-fetched. The reason is much simpler: (1) his speech was in opposition to Corbyn; (2) he lined up with the Tories; (3) he appealed to the superficial approach that passes for political thought in our media and in Parliament. The idea that 65 MPs lined up with Benn and our media applauded because he was wrong-footing simplistic lefty notions of foreign policy just won’t bear examination. It is an unnecessary hypothesis. I suppose Blair and Bush and co dealing arms and oil with Syria and Saudi Arabia/ Libya was not deemed “support for fascism and medievalist reaction”. Apparently if you’re a Labour rightwinger, that’s alright then. And there’s no credible *Labour Party* figure on the left who have defended any fascist or medievalist leader. Who cares what Galloway and a bunch of out of touch Trots think ? I do not claim that the enthusiastic reception given to Benn’s speech can be simply attributed to thye simplistic “blow-back” analysis of Stop The War (and, sadly, Corbyn). And I’m sure a lot of it had to do with the nachinations of the right. But the fact remains that Benn’s speech exposed the terrible weakness of sections of the left, when it comes to Islamic fascism. And when I say “weakness” I mean that some of them (eg Rees and German of StWC) actually *support* it. Yes the opposite of the neo-Stalinist supporters of the pro-Russian imperialist semi-colonial tyrannies against revolution are those who support the civilising mission of Western imperialism and Zionism such as our friend Jim Denham. They appear opposed but they are identical when it comes to hatred of democracy and revolution. So many of those who have since tried to evaluate Benn’s speech have also commented on how difficult it is to see both why he selected the ‘St. Chrispin’s Day’ speech as his strategy and also why so many Labour MPs voted for simplistic bombing as a solution. The motives of both Benn and other supporting Labour MPs were so tricky to weigh when at the least, cautious counter arguments were so relatively strong. Although others have disagreed, I had personally discounted personal ambition as Benn’s motive. He surely would have insufficient years for high ambition to be eventually realised. Aside from some of the most superficial amongst Labour MPs, surely they must have realised the case was so weak. So why did ‘bombing’ win 66, even when it meant voting with the Tories? Judging by the overall level of Labour MP speeches we cannot rule out a number of very superficial thinkers amongst quite a vacuum of political talent. As a Progress editorial has implicitly and belatedly recognised, discussion and the rise of strong political strategists has been constrained by the decades of stifled discussion/campaigning in the Party. But that surely does not explain the 66? I was troubled by this until listening very closely to Emma Reynold’s recent inflamed and factually incorrect challenges to ‘Stop the War Coalition’. Her attack on the organisation (other than those leading it) was on their general opposition to what she called the “West in world affairs”. She was clearly very defensive and protective of a combined, ‘West Strategy”, almost without regard to whatever constituted that strategy. For me the coined then dropped – Labour MPs were not essentially addressing Syria and bombing as I had assumed. It was about Jeremy’s aim of creating an independent UK foreign policy. Breaking with the US was so much more important than the immediacy of the bombing of one troubled nation. Benn has let people know he is able and waiting one great speech if you like and he is ready. lets be honest the right thinks is has leaders all over the place ready and waiting Chuka damaged himself by not staying in the leadership contest coming up with a lame excuse. But Benn has now shown that if they can get rid of Corbyn then he is ready even if it is losing the next election . Would the left keep him out I doubt it because MPs can get rid of any let leading MP they simply not vote for them. I agree completely with Jim Denham’s critique of both Jeremy Corbyn’s and huge sections of the Left generally in breaking away from the dreadfully selective soviet era analysis of “imperialism” (ie, imperialists are only those in alliance with the USA). This inadequate analysis makes it impossible for the Left to accept the secular Kurdish forces’ right to access vital air support from Western powers. It also underlies the Left’s (and particularly StWC) craven failure to attach the accurate label of “clerico-fascist” to the barbaric warlordist forces of Daesh. Or to oppose the murderous dictatorship of Assad – or his Russian (imperialist) backers. This failure of approach – evident in Jeremy’s selective neo- pacifist speech, seriously damaged his ability to crush Hilary Benn’s simplistic , Tory narrative, supporting speech. As to the Labour Right’s desperate search for a new figurehead leader figure. The” Mr Chipps” lookalike , academic/aristocratic Hilary Benn as a believable new leader of the Labour Party is simple an incredible fantasy . Just as the much promoted Liz Kendall was entirely a fantasy leadership figure of the Labour Right and mass media . The core problem of the Labour Right isn’t only a lack of a potential leader – but the fundamentally crap Tory-lite neoliberal politics they all espouse. As the Leadership debates, and the leadership result clearly showed – this politics has no appeal to the mass of the current Labour Party – whoever the Right and mass media have fronting it up. Positive reception of Benn’s speech by whom, you would have to be blind not to know the answer to this. Ego is what motivates Benn, believe it or not it runs through the family, the difference with Tony was he had a strong political anchor. (especially in later life) Hilary’s politics represent his classes, with a more human face. His judgement is appalling, three times he voted for war. As to the Blairites MP’s who voted yes, emboldened by the media crescendo, they simple reverted to type. Benn’s speech was a disgrace. A shrill, hysterical piece of rabble rousing more appropriate to the street than a parliament. The fact that the Tories applauded and lauded it so fulsomely should tell you something. Bombing Syria will have the same effect as it has had in Iraq. It will kill civilians and the only beneficiaries will be Iran and ISIS. At the same time the world’s major powers are not butting up against each other in every part of the world bringing the inevitable world conflagration that must come with the collapse of capitalism and the rapid unraveling of globalisation that bit closer. Should have supported the Arab Spring. Should have imposed a No Fly Zone back in 2013 when it was still possible. That would have ended the bombing, prevented the emergence of ISIS in Syria on the back of the unbelievable hypocrisy of the West and helped ensure that the decaying Arab tyrannies were replaced by national democracies instead of a fresh fascist hell. 4. The long-term political beneficiaries of that could only be ISIS. That it was being done by imperialism, that it would cost a lot of money, that it would not make `us’ safer and that it would bring a new global conflagration a whole heap closer were irrelevant. Our task as socialists, democrats and revolutionaries is to give unconditional support to the Syrian National Democratic Revolution. Suppose, he said, that dockworkers in an imperialist state with a fascist regime were on strike but that the imperialist fascist regime wished to send arms to a revolutionary movement in a semi-colony of a rival but democratic imperialist power for its own self-serving reasons. Should the dockworkers, he asked, lift their blockade so that the weapons can make their way to the struggling revolutionaries? Only an idiot would say no, he answered. StWC’s anti-imperialism is wholly and exclusively marshaled in the service of anti-revolutionism. Putin-loving neo-Stalinism is no less counter-revolutionary than Stalinism was. In fact it finds itself when it comes to Syria in a modern version of the Stalin-Hitler pact as it is in alliance with the European far right when it comes to supporting Putin’s intervention against democracy in that country. David Pavett – good forensic stuff, calmly taking apart the spurious claims and “truths” that silly Hilary spoke. I would go further than you do, and make the point that all the speakers that day, including Benn, Corbyn, Beckett, Cameron et al, were faking their “passion” and “outrage”… no MP had the honesty to stand up and simply say that to extend bombing or not to extend bombing would not make the slightest difference to the Syrian civil war or bring ” peace” any closer or make the UK “safer” from jihadist terror. All sides pretended that there were important principles and ideas at stake on this vote….when, objectively, the vote was of marginal and miniscule political or military importance. Barely a footnote in this brutal, sadistic, sectarian Islamic civil war. The whole debate was an amateur dramatic performance, no more no less, pointless and pathetic….let’s not dignify it any further. Thanks for being the first person to comment on what I wrote rather than, as is the case so often, just using the piece as a peg on which to hang declarations that are made regardless of whatever the original post may have said. I think that the dynamics of the debate on the Labour side had far more to do with internal Labour divisions than with serious considerations of the Syrian conflict. On the other hand, I wonder why you think that Corbyn was “faking it”. I just watched his contribution again. I am not a Corbyn “groupie”. I have my doubts and criticisms of aspects of his politics. By honestly, I can see nothing in his Commons speech in the Syria debate that could reasonably be described as “faking” passion and outrage. I wonder what you have in mind. Corbyn’s speech was calm, reasoned and consistent with positions he has long held (unlike Benn’s). David – why do I think Corbyn was faking it? Because he – like Benn – was wildly overinflating the importance of the whole debate and vote with talk of “a rush to war”, ” increasing the terror threat over here” and a hundred other meaningless phrases which he must know are untrue and ridiculous. I believe he was delivering the stereotyped performance expected of him, and I don’t think he meant a word of what he said. He knows that the UK is already at war with Islamic State in Iraq, alongside 50 other countries, so there already is a “rush to war”. All that now changes is that a few UK planes will drop a few more bombs on a few more oilfields, only this time across the Iraqi border in Syria. That’s all that will happen. A footnote in this murderous civil sectarian war. Of marginal and minuscule political or military importance. And he knows that when he says “bombing will increase the terror threat in the UK” that too is sophistry. Jeremy proposes defeating Islamic State by choking off its oil revenues, Gulf funding, Saudi support – but he must know that that too would ” provoke” the Jihadists and increase the terror threat in the UK too! He defeats his own – albeit fake – arguments at a stroke. And on and on. A puffed up, ridiculous House of Commons “agonising” in public over their “principles”… that was the performance on show that day. Benn and Corbyn both played their bit-parts to the best of their abilities, and like bad actors soaked up the applause of their in-on-the-scam colleagues. Sad. I share some of your doubts about Corbyn’s rhetoric but that seems to me to be as much a reflection on the low level of debate on these issues that passes for political discussion on the left as a reflection on Corbyn. It is, of course, a pity that he is, so far, unwilling to dump the rhetoric but I can see absolutely no reason to doubt his sincerity. Apart from anything else, his record on the issue has been very consistent over a long period. Also his speech consisted of far more than rhetorical flourishes. He made many telling points. The important thing, I believe, for all of us on the left is to base our arguments on objective analyses and to stop appealing to recieved notions and knee-jerk rhetoric. That is what I try to do when I make a contribution and what I tried to do with Benn’s speech. I unpicked aspects of the speech that I am not aware had been done by anyone else. None of that has been picked up, commented on or questioned in this ‘discussion’ thread. That for me is a disturbing reminder of the low level of debate on the left. That, I believe, is the biggest danger for the Corbyn leadership. The left shows an alarming number of signs of not being able to rise to the challenge. I’ve heard Benn speak before and he is a very good speaker – he knows how to press the right buttons but he is not a patch on his radical liberal dad and it was intellectually lightweight. And just think Benn’s internationalism has invaded Iraq, invaded Afghanistan, bombed Libya, and is now bombing Syria. Although I”m sure the people of the Middle East will be impressed with his oratorical skills and ‘solidarity’ though they may not quite appreciate the bombs. The first casualty of war is the Truth and apparently after 1,300 air raids in Iraq we have killed 330 so called IS fighters and no civilians – it’s a miracle I tell you. And the first UK bombs in Syria hit oil fields and gas plants and aren’t these populated by workers (who probably had little choice in the matter) and brothers and sisters weren’t they also likely to have also been trade unionists? I bear no personal malice against the 66 in Labour, they are decent human beings (but like the rich and powerful) perhaps now qualify to join the little people of the planet as lightweights (but with power). No-one has a automatic right to sit at the (Left) democratic socialist table so hopefully in a few years time Left Wing democratic socialists will choose Left Wing democratic socialist MPs. What I am arguing for is to let ideas and internal democracy in Labour decide. We do need to move on and whilst some may have burnt their copy books the priority now is to fight for the millions in the UK who are suffering under the Tories (and those who care about them) and the millions around the World who are suffering too. We also need to fight Tory draconian ideological policies like bringing in 2-5 year fixed tenancies for new council tenants- imagine if we were to force all owner- occupiers to sell their homes every 5 years (which we wouldn’t dream of doing) but how the upper class and middle class Tories interfere in the lives of sections of the working class/working people from a position of middle class/upper class ignorance and prejudice. But I can’t criticise without offering ideas to defeat the grotesque so called IS. First end our imperialism and give oil etc. grabbed by Western TNCs back to the people of Iraq etc. to try to win the tribes against so called IS. I would bomb so called IS with political leaflets to try to undermine them in the areas they control. But most fundamentally we need to try to unite diverse working people of all religions and of none and we are the many and grotesque so called IS are the few. Solutions need to come from within and you can’t negotiate with so called IS but the boots on the ground to liberate themselves against the Tyranny of so called IS must be Muslim. A democratic socialist approach to enhance the grey zone, uniting diverse human beings is how we win. But only when we really start to value all human life will we truly win.